In celebration of its Centennial (1908-2008), the Kellogg School has produced Wide Awake in the Windy City, written by its editorial director, Matt Golosinski. The book is being published by Northwestern University Press this month. Using archival material, first-person narrative and photographs, the book traces the century-long ascent of Kellogg from its 1908 inception as a part-time evening program in Chicago's Loop to its development into a global management education leader. The story and 100-plus photos put the school's strategic decisions into context and bring to life its most important catalysts: deans, professors, students, alumni and business practitioners. In more than 400 pages, the text chronicles all areas of the school, documenting the rise of its vaunted Marketing Department, the development of its quantitative, research-oriented curriculum and the creation of its hallmark collaborative and innovative culture. The book goes behind the scenes to explore how Dean Emeritus Donald P. Jacobs built the school's world-class Executive MBA Program and how an improbable $10 million gift from the J. L. Kellogg Foundation in 1979 helped catapult the school into the national spotlight. The book also highlights more recent history, such as Dean Dipak C. Jain's success in enhancing the school's global brand, strengthening its alumni network and reinforcing its teaching and research excellence. There are even some unexpected twists that appear, like the time that Northwestern and the University of Chicago nearly combined their resources after the Great Depression. The plan, kept secret initially, would have resulted in a single university, but the idea was eventually abandoned due to concerns raised by alumni and Evanston stakeholders. "Writing the history was fascinating. You really see how the school becomes integral to its community, said Golosinski, who joined Kellogg in 1999 and is a 2006 graduate of the Kellogg Management Institute. "You see the school's entrepreneurial character over the decades. You also see how business leaders 100 years ago grappled with challenges and how Kellogg has continually helped address these problems. Perhaps most strikingly, you see the dedication and character of the people whose love for Kellogg has propelled it into the top ranks. That didn't have to happen, but it did, and the story is gripping." Offering insight into strategic decisions — whether associated with building the influential Managerial Economics and Decision Sciences Department or else the bold move to dismantle the undergraduate business curriculum in favor of an untested graduate program — Wide Awake aims to be an engaging resource for casual readers and for those seeking a detailed understanding of how an unassuming Midwestern school evolved into one of the world's most prestigious institutions. 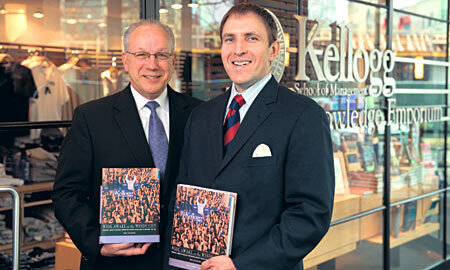 "The last century has been a remarkable ride for Kellogg," said Richard P. Honack '94, who edited Wide Awake. "But what was also important for Matt Golosinski to capture in this book was a sense of what Dean Jain calls 'the journey ahead.' What will be the enduring value proposition of the MBA and how will Kellogg continue to be an innovator in management education? These are things we wanted to put out front too. I think readers will get a holistic sense of where Kellogg and Northwestern University have been and where they're headed." Wide Awake in the Windy City is available at bookstores and online now.